This beautiful circa 1930s handmade oak end elm court cupboard has been made in an earlier style with an oak frame and elm carved panel inserts. It has traditional forged iron hinges, and is in lovely condition for its age. There is no significant damage, but there is a slight split to the top which we have photographed. As this piece of furniture looks much older, the split does not detract from the overall appearance of it. With its convenient size, this court cupboard is an ideal addition to any period style interior. 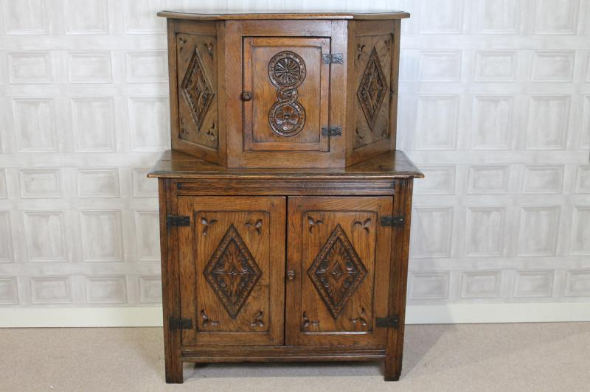 If you would like any further information about this 1930s oak and elm court cupboard, please contact us on 01543 375872.